In today’s era of Uber, Waze, Amazon and Netflix, it’s tempting to seek out the easiest, most convenient solution to any need or challenge we have in our work and personal lives. Even fitness apps and wearables—from FitBit to stay-at-home group spinning rides—are taking some of the work out of workouts. But the easier way isn’t always the better way according to astronauts, Mark and Scott Kelly. 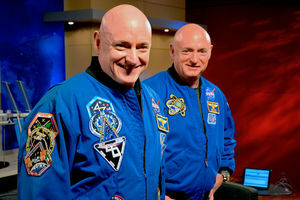 The 52 year-old twins, who have logged a combined 576 days in outer space, delivered a rousing keynote speech at the American Society of Association Executives annual conference I attended last week in Salt Lake City. Yes, there’s an association for association professionals—33,000 members strong. Many of you are financial professionals. If you’re not working with trade associations in your area—you’re missing a huge opportunity. More on that in a future post. Meanwhile, many of the lessons the Kelly brothers learned from the NASA training program are transferable to your practice. As President John F. Kennedy famously said during the Kelly’s formative childhood years in the late 1960s: “We choose to go to the moon in this decade, not because they are easy, but because they are hard.” By going into space, the Kellys said they were able to accomplish something really hard. But in order to be as successful, they had to set goals, plan, test the status quo and take risks along the way – all skills that you can relate to. ASAE President, John Graham, told me during an exclusive interview that the two biggest takeaways he got from the Kelly brothers’ keynote were: a) just because you are not good at something initially, doesn’t mean you can’t get good at it and improve and b) you should simply focus on what you can control. Scott put this mantra into action when his sister-in-law and Mark’s wife (Arizona Rep. Gabby Giffords) was shot in the head by a protestor in 2011. Scott was up on the International Space Station at the time. While he couldn’t be with his family during the tragedy, he was able to complete his mission and take care of his crew. In a time when there are a million distractions during each day, the Kellys said focusing on what you can control is key to accomplishing your goal. Those of you with accounting backgrounds are often chastised for this trait but the Kelly’s said NASA’s philosophy is to worry about everything. It’s all about protecting its astronauts from any possibility and you should take the same approach with clients. As Mark explained, the level of risk flying a space shuttle mission is high – about the same as storming the beach at Normandy on D-Day – and NASA takes that risk seriously. With your practice, you’re the captain, so it’s your job to look at every minor detail or decision and consider the consequences to your staff and members. Many of you had to overcome plenty just to get through school. We know many of you struggled through well-paying, but unsatisfying corporate jobs before setting out on your own and it wasn’t just a string of successes without a few stumble along the ways. There were numerous times when the Kellys, and even their classmates and trainers, wondered if the space program was really right for them. But they pushed on, inspired in part by their mother, a New Jersey secretary and waitress, who failed a grueling physical fitness test numerous times before becoming one of the state’s first female police officers. Long story short, the Kelly brothers made it through the space training program and left a pretty significant dent in the universe. Keep banging away and have a great weekend. Our blog and website has more.